Summary: Missouri, 1849: Samantha dreams of moving back to New York to be a professional musician—not an easy thing if you’re a girl, and harder still if you’re Chinese. But a tragic accident dashes any hopes of fulfilling her dream, and instead, leaves her fearing for her life. With the help of a runaway slave named Annamae, Samantha flees town for the unknown frontier. But life on the Oregon Trail is unsafe for two girls, so they disguise themselves as Sammy and Andy, two boys headed for the California gold rush. The friendship between Sammy and Andy begins as they rely on each other for survival, but deepens as they share about themselves. I appreciated that the romance aspect of the book didn’t completely overwhelm the friendship narrative. I enjoy romance, but am happy when a book can be more than that. 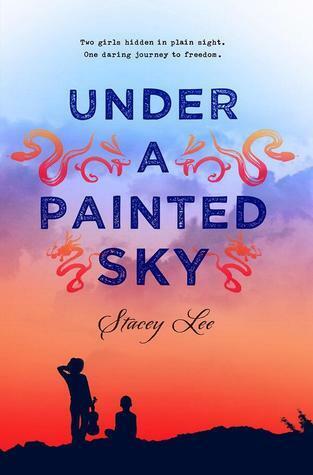 Under a Painted Sky often has a lighthearted feeling, yet still deals with serious issues like racism, family loyalties, and gender roles. Stacey Lee has delivered a story that entertains yet also provides food for thought. One more thing — the cover had me immediately. I don’t even think I cared what the book was about at that point. The sky is gorgeous and the silhouettes caught my eye. Eventually, I noticed the dragons, but it took me a lot longer to realize that the other squiggles weren’t just designs. I only understood when I closed the book at the end. Theresa Evangelista did a fabulous job on that cover design. Recommendation: Get it soon especially if you enjoy historical fiction with plenty of action and a nice dose of humor. While not everything in the book is completely believable, I was totally willing to go along for the ride. Under a Painted Sky is a highly entertaining novel.